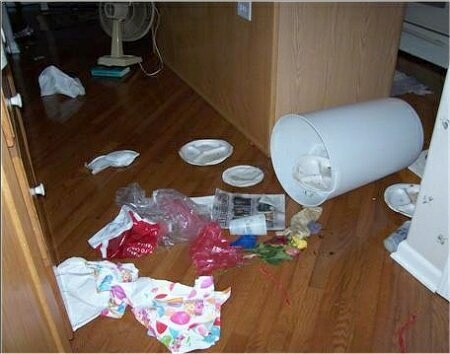 "I remembered too late that I had forgotten to empty a full wastebasket and knew what I'd come home to—and I was right. 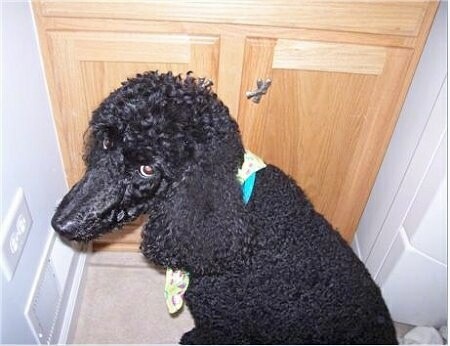 As I opened the door, Katie the Standard Poodle tried to get past me in order to escape the crime. I did a body block, stepped in quickly, and the two of them, Katie, age 5, and Bobby, our Miniature Poodle, age 10, who is the usual culprit, put themselves in the corner." "I growled "stay" to the dogs and ran for the camera... that look of guilt was too good not to document." "Katie gives a look that says, "He did it, Mom.... I had nothing to do with it!!!" 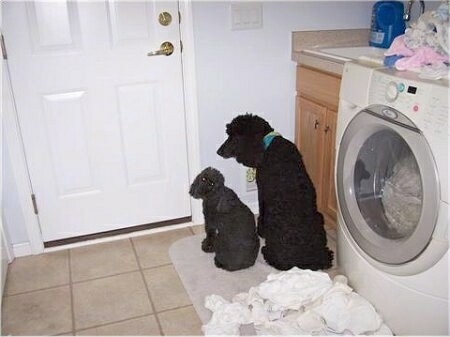 Who says dogs don't feel guilt??" Spirit the 2-month-old Siberian Husky puppy caught chewing up a Christmas present! "I noticed that there were chew marks on the corner of a box I had in the living room. The box had a Christmas gift in it. Anyway, I thought it was my older 1-year-old Valley Bull Dog, Diesel. Come to find out it wasn't; it was Spirit! All along I was blaming it on Diesel." "This is my little Maltese / Shih-Tzu (Mal-Shi), Jessica who loves to disembowel her toys, and in this case it is "The death of Ronald McDonald." She is the most beautiful, playful, friendly little dog who came to me as a stray, completely matted from head to toe. She is very treasured." Patch the American Bulldog puppy at 10 weeks old CAUGHT chewing on a pumpkin! 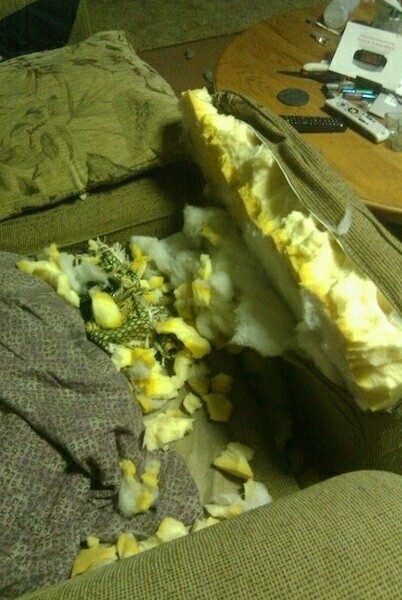 Lacey the Tosa / Boxer mix breed dog at 1 year old CAUGHT chewing up the couch!—"Lacey is a Tosa Inu / Boxer mix. She gets almost daily running at my neighbors house where she plays with her Yorkie and variety of small dogs that are being dog sat. Her best friend is Maggie a 3 yr old Lab mix. Lacey loves to chase squirrels and play with seashells. However her most favorite thing is cuddling on the couch with me, until she chewed it all up. Lacey is a very well mannered dog. She never barks and knows most basic commands, though she is in the process of learning how to speak. I always told her not to bark so now she doesn't want to. She lives with three cats. Two do not like her and the youngest one who is 4 months older than her and tolerates her and will sometimes play with her (as long the others are not around)." Harper the 4-month-old Golden Retriever puppy CAUGHT chewing on a pair of jeans. "After coming home from the grocery store, upon walking into the bedroom I noticed that our little golden girl had taken a pair of my jeans out of the laundry and was gently gnawing on them. As I harshly said "HARPER, DROP IT" she rolled on her back, and "smiled" as you can see in this picture. That's my girl!" "This is a pic of Zoey at 5 months old (one of our two Boston Terriers) caught in the act giving our granddaughter Lily one of those well-known BT kamikaze kisses."